Pediatric Audiology is a practical how-to reference for the diagnosis and technological and educational management of infants and children with hearing disorders. Master clinicians distill decades of expertise, providing step-by-step descriptions of testing and treatment protocols, with a special emphasis on specific pediatric behavioral assessment techniques, such as behavioral observation audiometry. A DVD-ROM accompanying the text features videos of the various pediatric behavioral assessments with audio commentary that provides straightforward explanations of key concepts. Also included on the DVD-ROM is a video on cochlear implant surgery. 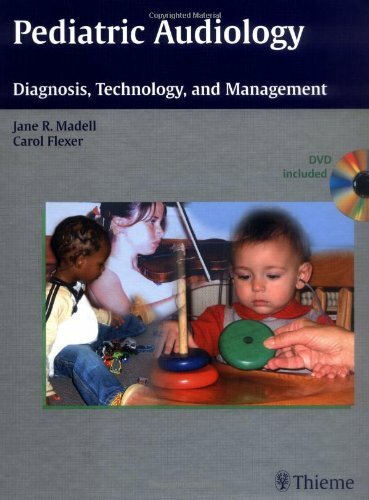 Features: * Videos of both normal and unusual pediatric testing situations prepare the reader for the full range of scenarios in everyday clinical practice * In-depth discussion of educational management issues helps practitioners develop collaborative approaches to pediatric hearing loss * Bullet-point lists of key points at the start of each chapter and discussion questions at the end of each chapter set a framework to guide the reader through each topic--ideal for the university classroom setting * Flow charts and graphs provide a practical breakdown of complex concepts * Pearls, pitfalls, and special considerations emphasize important points This authoritative multimedia reference is ideal for students in professional and graduate-level pediatric and educational audiology programs. Audiologists will find it to be essential as a field guide to new techniques or to procedures that they do not perform regularly. The book is also valuable for speech-language pathologists, otolaryngologists, pediatricians, and teachers of children who are deaf or hard of hearing.